What is it about people in uniform that makes us all want to turn and look at them? 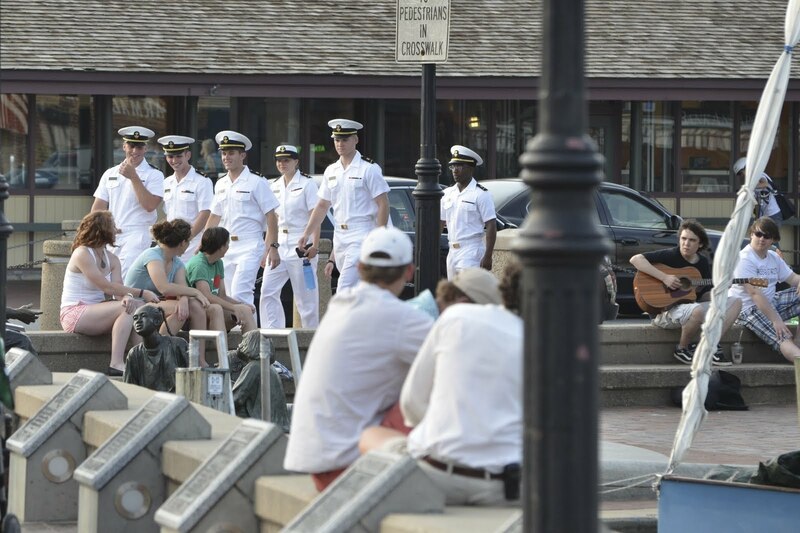 When The Professor and I headed down to Annapolis Friday, we didn't realize it was the U.S. Naval Academy graduation day for over a 1,000 graduates. 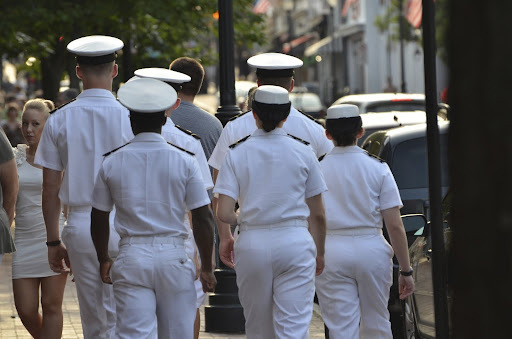 Fortunately, when we arrived in the afternoon, the ceremonies were over but there were still a lot of uniforms walking the streets. They seemed to capture the spirit of the day. Youth, confidence, promise. Lots of good energy! Needless to say, I couldn't resist my own stares. Even the woman below has to sneak a peek. Just something about uniforms. They just look so damn good! By the way, I'm lovin' this long weekend .... how about you? what an awesome post for memorial day weekend. :) dress whites! Memorial pictures for a memorial weekend. These photos are very cute! Love the way the girls in the first photo are in la-la land over the men in uniforms. They seem to be enjoying it too! 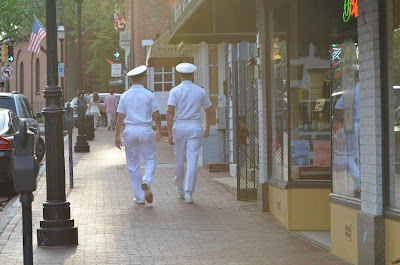 My husband grew up near Annapolis - I loved walking around the old town and visiting the Academy. Great shots! I agree there is something about a group of people in uniform, great capture, wonderful shots for this weekend. Thats really thrue, there is something special with uniforms! :)) Have a nice day! My brother is a cop and many of my friends told me my brother is handsome or hot, I said really? Darn I didn't know that hehehehe! something in those uniform that they look very attractive. Thanks for sharing! great memorial day weekend shots! i would have loved to have seen all those men and women in uniform and to take photos of course !! weekend....so far so good. tomorrow looks to be spectacular !! wonderful captures .. I agree youth and energy!! They look so crisp and sharp! They are all very eye catching aren't they? Especially in the white! Our long-weekend was last Monday in Canada ~ but thankfully ~ I took today off as a holiday. Long weekends are the best aren't they? 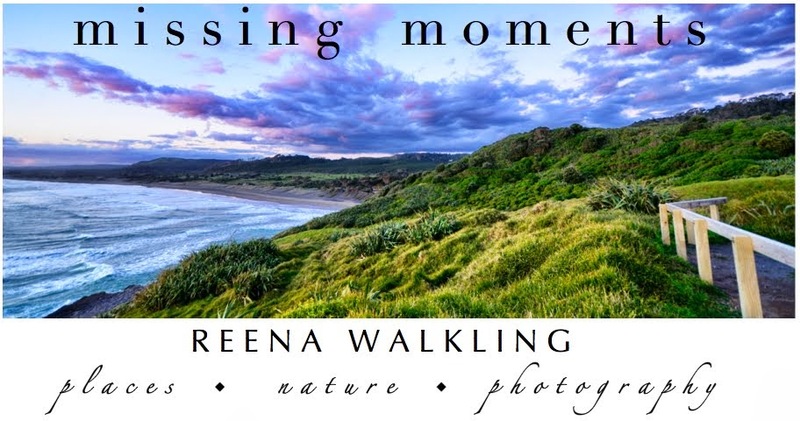 Hope you are having a good one Reena! We were born and raised near Great Lakes Illinois and we always saw the men and women in uniform, especially on graduation weekend. I still love to see them. It's a quiet weekend for us...next weekend is graduation weekend and that will be a very busy weekend.